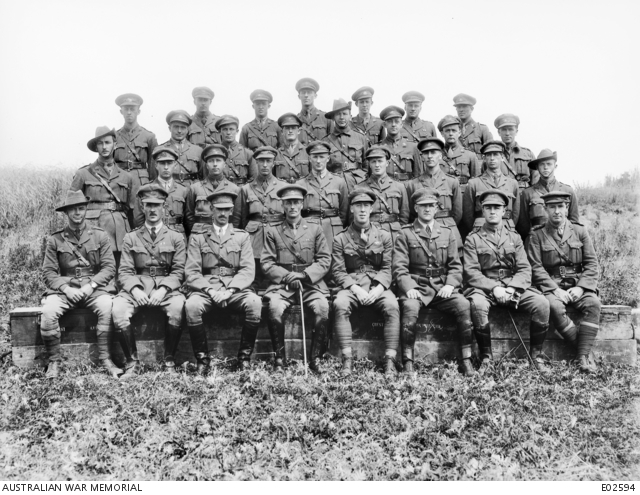 Group portrait of officers of the 20th Battalion. Back row, from left to right: Lieutenant (Lt) Claude Ewin Cameron MC & Bar from Turramurra, NSW; Lt John Patrick Thomas MC from Forbes, NSW; Lt Walter Harold Elkington MC from Summer Hill, NSW; Lt Kenneth Edward Webb from Sydney, NSW; Lt Daniel Herbert Anthon DSO, MC & Bar from Petersham, NSW; and Lt Albert Henry Sharp MC from Wiltshire, England. Third row: Lt Cecil Breadalbane Ayling from Glebe Point, NSW; Lt Hubert Worthy Tripp from Razorback, NSW; Lt John Hugh McKenzie from Lochinvar, NSW; Lt Eric Lewins MM from Bathurst, NSW; Second Lieutenant (2nd Lt) Francis John Noble from Marrickville, NSW (killed in action in France on 31 August 1918); Lt George Gordon Richardson from Manly, NSW; Lt Walter George Lawrence Bain from Potts Point, NSW; and Lt Thomas McGill from Lewisham, NSW. Second row: Lt Lindsay Gordon McColl from Bingarra, NSW; Lt Oscar Alexander Beattie from Wagga Wagga, NSW; Lt Stanley Robert James Staunton from Waratah, NSW; Lt George Duncan Jarvie Low from Greenwich, NSW; Lt Herbert Cecil Winkworth from Annandale, NSW; Lt Kenneth Irwin McMillan from Gerogery, NSW; 2nd Lt Julian Reginald Gladstone Gardiner, Croix de Guerre from Blayney, NSW; Lt Stanley George Burdus DSO from Parramatta, NSW; and Lt Arnold Ruskin Treacher from Sydney, NSW. Front row: Captain (Capt) John Malcolm Moore from Plumpton, NSW; Capt John Allan Broadbent MC from Greenwich, NSW; Major (Maj) William John Rendal Scott DSO from Bingara, NSW; Lieutenant Colonel Frederick William Dempster Forbes DSO from Canterbury, Victoria; Maj John Herwood McDonald DSO, MC from Summer Hill, NSW; Lt William Henry Gladstone Guard from Thirroul, NSW; Quartermaster and Honorary Captain Stanley Roy Kent MC from Annandale, NSW; and Chaplain Captain Robert James Wentworth Glasgow Crawford from Toowong, Queensland.